Fishing is a progressive and evolving passion. It starts with a Zebco reel and half a loaf of stale bread, and usually peaks somewhere halfway around the world with a Sage fly rod and a hand-tied-super-secret fly. The passion grows and changes, ebbs and flows, and as it does the watersports industry is tasked with staying one step ahead to keep anglers on the cutting edge of technology and to push the boundaries of the sport. With each step in our progression as fishermen we find ourselves ultimately trying to get closer to nature. We reduce the artificial surroundings to minimize distractions, to focus on what we’re really out there for. The real reason we wake up at 4:30am on a weekend, and stay up until midnight tying knots and studying maps isn’t so we can take pictures for Facebook to prove to people we can fish. We dedicate our time to these chores so we can see the sunrise while we drift an empty flat, stalking redfish tailing in the mud. So we can sneak further into the mangrove tunnels to find the hidden bay with rolling tarpon. So we can silently float into position ahead of the cruising bonefish, the busting jacks, the crushing snook. It is so we can find our own nature, peace, or solitude; our own escape. Live Watersports has created a giant leap forward on the progression scale, re-defining the boundary between angler and nature. Fishing from a paddle board puts you completely in control, completely in touch with your surroundings. Though the challenges of paddle board fishing can be great, the rewards are so much greater. Paddle board fishing requires an angler to consider many elements that otherwise would not factor in to a day of fishing. When planning your paddle board fishing trip, you must consider the limits of your stamina, how far you can paddle round-trip from the ramp. When you rig the night before you must consider the weight of your gear, access to your essentials, and functionality of each piece that you bring. Depending on where you are paddling, the weather you may encounter, the tide, current, or water depth, you will bring specialty items to help you deal with each. When you load up your vehicle in the morning, you must do so in a manner that lets you get the board to and from the water quickly and efficiently. 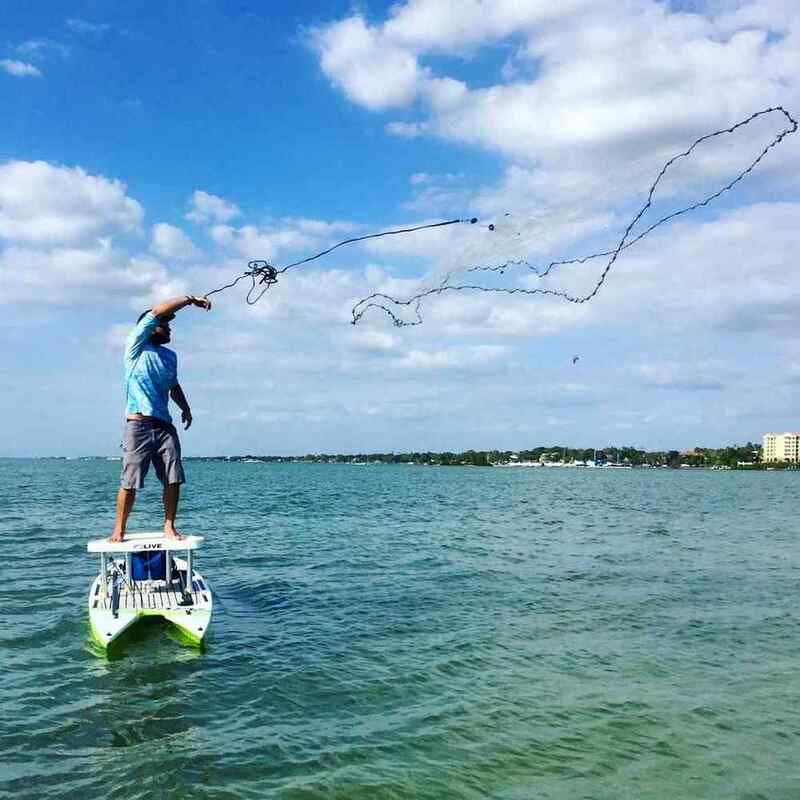 When you do start fishing, you must factor in the direction your board is drifting, how quickly you can go from paddle to rod, how much drag to use when a big fish starts to tow you around, and how to keep a fish from dragging you into the mangroves. These are some of the challenges, all easily surmountable with a little planning and practice. However when you launch the board and take that first stroke of the paddle, standing tall and gazing into the crystal clear water as the sun breaks the horizon, with not a sound except the pelicans diving , mullet jumping, and dolphins breathing: it all becomes worth it. There is no motor noise, no electric hum, no opening or closing of hatches, or anchor chains rattling. Just the soft swoosh of your paddle, the breeze through the mangroves, and your heartbeat in your throat as you see the big redfish tail swaying happily only a cast away. On a paddle board, you have the ability to get much closer to fish, often paddling right over the ones that sneak up on you. Depending on your fin set up, you can get as shallow as a couple inches to chase the skinny fish, and you can handle boat wakes or wind chop with ease thanks to the twin hull design of the L2Fish. The large deck space on the L2Fish makes casting easy in any direction, and the stability allows you to turn around and cast behind you if you must. Throwing a cast net is a breeze from the L2Fish (just remember to spread your legs, bend your knees, and don’t follow the net into the water). The L2Fish and the Utility are also well designed for fly fishing, leaving plenty of deck to manage the fly line, and providing a silent steady platform to get well within casting distance of any flats or open-water prey. Fishing from a Live Watersports board is the next level of fishing adventure. The excitement, challenges, and rewards create the ultimate day on the water. The capabilities of the cutting edge designs open all new doors to skinny water fishing, fly fishing, and even open water excursions. Each board can be customized and accessorized to each individual angler, making the boards more functional and efficient than ever before. I live for stand-up paddle board fishing. What do you Live for? LIVE's L2Fish and L4Expedition can be outfitted with a custom free flow live bait well that fits right on the front or back of the board and allows the water to cycle as you paddle. Russ Novak's prepped and ready to go for an afternoon of fishing on his L2Fish paddle board. The Cavitts love combining the love of paddleboarding and fishing into a fun family activity.